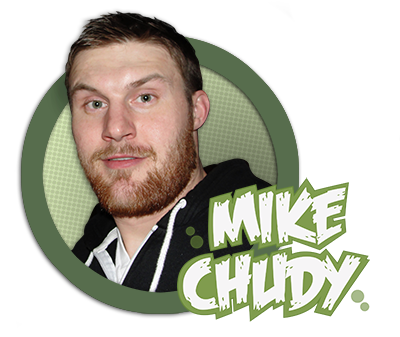 I’m Mike Chudy, a cartoonist from Buffalo, New York. In 3rd grade my Mom would pack my lunch in a brown paper bag that had a picture of Garfield wearing an overcoat printed on the front. I used to draw that image over and over for the kids in my class. That’s when I decided to drop out of school. No wait… That’s when I decided I wanted to draw for the rest of my life! That’s right folks, I in fact went on to complete the 3rd grade, finished up high school and eventually even graduated from College. The whole time knowing that whatever happened, I was going to draw! So, here we are. This is my webcomic. Strange-Neighbors! I hope you’ll join me as I figure this thing out. Come on! Hop in on the ground floor! Pack up your crap and move on down to Strangetown. Won’t you be my neighbor?